This is an obscure computer, not very well known. It's a rugged field computer, conceived to be used outdoor, and resistant to extreme conditions (it was used in the British Army for example). 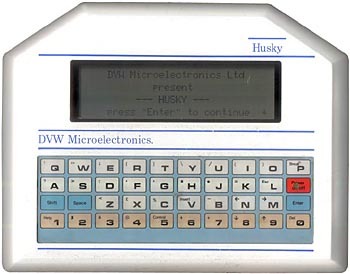 In 1981, responding to a request from Severn Trent Water, DVW designed and manufactured the first rugged handheld computer - the Husky, dramatically featured on the BBC TV programme 'Tomorrow's World'. This caught the attention of the UK Ministry of Defence, who subsequently awarded DVW a contract to supply the MOD with rugged handheld computers as part of the Rapier missile project. Husky (it will become the name of the company some years later) has become since a familiar name in the niche market for rugged field hardware. The Husky was the first, or at least one of the first real portable computer. And as it was waterproof against accidental immersion and rugged, it was very expensive (~5600 Euros). The Husky had a small LCD screen (32 x 4) and a flat membrane keyboard, just like the Sinclair ZX-81. It has a basic interpreter, an onboard clock (unsurprisingly lacking in millennium compliency), onboard routines for communicating through what looks like a serial port interface, as well as a menu option for "cloning husky". This must be used to clone multiple Husky systems that will all be used for the same purpose, rather than re-entering the BASIC code for each unit. The unit stores programmed entered into the basic interpreter in some kind of solid state memory which must be powered by the backup battery (since when you take the backup battery out, you lose the basic code). In 1983, the Husky Hunter is launched. DVW changes its name to Husky Computers Limited and moves to the Courtaulds site in Coventry. see more DVW Micro-electronics Husky Ebay auctions !